Factor of Safety is used to provide a design margin over the theoretical design capacity to allow for uncertainty in the design process. It is how much stronger the system is than it usually needs to be for an intended load. 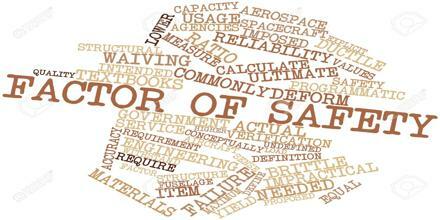 Factor of Safety is a constant value imposed by law, standard, specification, contract or custom to which a structure must conform or exceed. It is often required that the factor of safety be checked against both yield and ultimate strengths. On brittle materials these values are often so close as to be indistinguishable, so is it usually acceptable to only calculate the ultimate safety factor.